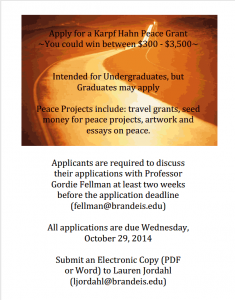 The deadline for the Karpf and Hahn Award application is October 29th. Though primarily intended for undergraduates, graduate students may apply and have been awarded in the past. It is a great opportunity to implement a peace project, attend a peace-related conference or develop art work on something you care about. Prizes range from $300 to $3500. If you’re interested in applying, you should set up a time to talk to Professor Fellman about your idea ASAP.